My father worked for IBM and he had a shelf of books that he kept upstairs in my bedroom, for lack of any other bookshelves in our house. I assume these were books he’d gotten from work. One was a set of manuals for programming in Fortran, a computer language I was trying to teach myself in the eighth grade. Admittedly, I was a nerd, especially considering that this was 1963 and personal computers didn’t even exist. Programming was done on cards punched with holes and computers were the size of two-car garages. But for some inexplicable reason my father had a manual card puncher at home—inexplicable because my father was a salesman, not a programmer. But the book on that shelf that interested me most was an introductory guide to probability and statistics. And, yes, I did wear thick glasses and found math easy. What fascinated me about this book on probability was that many of the explanations of statistical properties used gambling games as examples—dice, cards, roulette wheels. Various known betting systems were discussed, all of which intrigued me, though all were disproven within its pages. Ever the optimist, I spent many months at the age of 13 trying to invent a gambling system that would work. When I left home at the age of 14 to pursue my vocation to the priesthood, I left all that behind. But before the second semester ended, I’d decided the religious life was not for me. I started sneaking off the property with the other seminarians gone bad to smoke cigarettes and hang out at the nearby mall, shoplifting snack foods, hoping to meet girls, anything to get away from the scary, claustrophobic walls of the Holy Ghost Fathers Seminary in Ann Arbor, Michigan. It was on one of these clandestine forays to the mall when I first spotted The Grifters on a wire rack of cheap paperbacks in the drugstore. It was the book’s cover that drew me to it—shiny, white, with two red dice that were just beautiful to look at. I stuck it inside my jacket, tucked it under my armpit, walked out of the store and hightailed it back to my dorm. It was the dice that got me. Was it a book about gambling? Did the author reveal some betting system he’d found that worked? No, but the author revealed something every bit as engrossing to me as a workable gambling system. He revealed that a writer could get a book published where all the main characters were bad guys. There was no hero in a white hat who would uphold the social mores of the world. It was bad guys against bad guys, short con artists versus long con artists, a man against his woman, a son against his mother. They were all rotten and it was the most wonderful book I’d ever read. The writers I compare Jim Thompson to are not other fiction writers, but writers who write on the precarious edge between fiction and autobiography—Henry Miller, Charles Bukowski, Hunter S. Thompson. Which is not to say that Jim Thompson wrote autobiographically, just that like these other writers, he had little use for heroes in white hats. 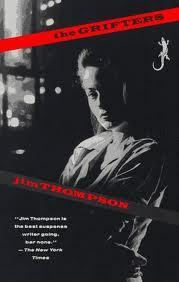 It was Jim Thompson’s books that initially opened this world for me. The book, alas, was confiscated by the seminary’s Rector, Father Halloran, who’d gone through my underwear drawer in my cubicle a week or so later while I was in class. But though I’d already begun to treasure books, and it hurt to lose a book I loved, I’d already read that one and The Grifters became just one more item of mine he’d confiscated. (In that same rummage through my personal belongings, Father Halloran also got Orwell’s 1984.) But the ever-vigilant Rector knew I would not be returning for my sophomore year—we’d had that discussion—so he was mostly easy on me. Provided I didn’t vandalize the property or act out in front of the good seminarians, he was fine with me finishing out the last couple months of my freshman year. He was a practical man. I believe he talked to my parents about me, and my parents—who were paying my tuition—would not have been pleased if their son—who was not doing poorly in school—came home having to repeat ninth grade. He was acting within the seminary’s rules and procedures when he confiscated items from me, and my parents would have been in full agreement with his decisions. The fact is we were not allowed to have books that had not been approved by the Rector and all of the books he approved were in our school library. Any other books, say, brought from home, had to be turned into him for approval. Here’s what I have to say about The Grifters that I haven’t seen in any of the other reviews of Thompson’s work I’ve read. Jim Thompson opens young minds to the world of literature in the way that every writer hopes to do. For that, he’s an American literary treasure. There isn’t always a hero on a white horse who saves the day. Sometimes, things go to hell and stay there. The cops turn out to be robbers. Sometimes, your friends are your enemies. In the opening scene in The Grifters, Roy Dillon is stumbling to his car, having just been hit in the gut with a heavy club, and as soon as he gets into his vehicle, he leans out the window and starts puking his guts out. Then a cop’s questioning him, and already, he’s lying to the cop. And he’s good at lying. It was a tainted chicken salad sandwich. That’s all. Chicken salad. The cop shows no suspicion. And you want the lie to work, because the guy’s just been smashed in the guts. You don’t want him to be arrested. You’re on his side. You want him to succeed at getting rid of the cop. On page one, you find yourself rooting for the bad guy, and you know he’s a bad guy. You know he’s lying to a cop. You think of all the times you’ve had to deal with cops, the times you’ve been pulled over for anything, major or minor. You want to get rid of them. Cops are scary. They have the power to put you away. You can’t help but feel for Roy Dillon, even knowing he’s some kind of criminal. Page one, and Jim Thompson has you wrapped around his little finger. Thompson writes in a plain-English style, nothing fancy, nothing avant-garde or even “writerish.” You never have to pull out a dictionary to look up a word. But it’s hard to put one of his books down once you get more than a page or two into it. The Grifters is one of those books I can’t read without thinking back to the first time I read it—the situation I was in, the disillusionment, the anger, the isolation I felt from everyone, even the other seminarians who had gone bad, who had lost the faith, lost a reason to be there. Who were these holy men who walked the halls in their black robes? Thompson made it alright to admit I was living in a world of con men, even knowing I was no better than them. Within days of having finished the book, I’d started writing. Seriously writing. I was inspired. I wanted to write stories, get people to root for the bad guys. We live in an ugly world controlled by villains in high places. Heroes pretend to show up, with promises and plans and solutions; but everyone knows there’s no way to fix it. Why does it mean so much to hear someone put it into plain English? Thank you. Is the better known John Cusack 1990 film noir true to Thompson’s book? The length of time between which I initially read the book at the (age of 15), then saw the film (at the age of 42), then reread the book (at the age of 64), is so great, I can’t say. I recall liking the film when I saw it, and it definitely had a lot the same feel as the book. I’ll have to watch the film again one of these days to see how true it is. What I really meant by ‘thank you’ was for the personal history into you, Arnold. And what strange karmic convergence: the beginning of my own ‘downfall’ was a Forbes article entitled The Grifters. The film is true to the book, but the book still feels darker. When you read the book, it feels as if everything were happening at night, even though it’s not. The psychology of the scenes darkens your mental pictures. In the film, there’s all that sunlight. I think film noir needs to be shot in black and white. And nice to see you, zengrifter, you mad man. Now I must read the book. I didn’t like the movie, found it very depressing. The novel keeps teasing you with hopeful moments, but all hopes are dashed by the ending, which is even more depressing in print than on film. You sort of stagger around in despair for a day or two after finishing it. Thompson’s not great for yucks. Although there’s a hilarious scene where Roy almost takes a sales manager job (like that could happen).